Facebook is a powerful place to run a contest, but the social network may not seem so friendly when you realize its strict rules regarding the kinds of campaigns it allows. LinkedIn recently outlined what marketers need to know before running a Facebook promotion. First of all, Facebook doesn’t want any direct involvement in promotions. In fact, its rules are designed to separate the social network from the contests run by companies and bloggers. Facebook’s promotion guidelines apply to all campaigns that result in the selection of a winner. In order to run a contest, marketers must administer the promotion via a third-party app on the Facebook platform. One of the most popular apps is Wildfire since the interface is simple to use and their rates are competitive. Marketers can select from 10 different kinds of promotions, ranging from photo to video to trivia. But there are also a wide variety of third-party apps that offer promotion services within Facebook’s guidelines. You do not want to attempt to run a promotion without one of these approved third-party apps. If you do, Facebook has the right to remove any content related to the contest, as well as disable your page, application or entire account. Consider yourself warned. When it comes to prize drawings where you’re using Facebook to collect entries, you are not allowed to contact winners or post winners on your wall. You can select a winner at random and feature him or her in the page photo, but other fans are not allowed to vote or submit nominations. In addition, fans cannot enter a contest by uploading photos directly on Facebook. They must use a third-party app on the Facebook platform to submit photos or content as their means of entry. While these rules may seem restrictive, there are plenty of things you can do with your Facebook marketing promotions. You can restrict your contest to only entrants who “like” your page. You can use a fan-exclusive reveal code to provide a promotional gift or discount code to people who “like” your page. You can also give away promotional items and collect names or email addresses from fans and visitors. 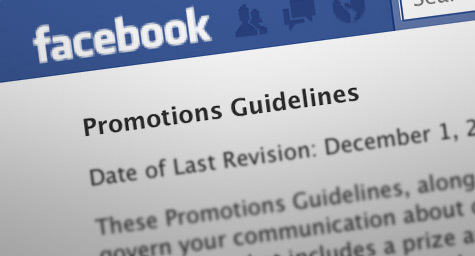 Be aware that all promotions on Facebook must have explicit terms that are visible on the canvas page. It’s about liability, and Facebook doesn’t want any of it. As long as you adhere to their tight promotion guidelines, Facebook can be a very friendly place for everyone. MDG Advertising, a full-service Florida advertising agency, with offices in Boca Raton and New York, NY, specializes in developing targeted Internet marketing solutions, exceptional creative executions and solid branding and media buying strategies that give clients a competitive advantage.Our core capabilities include print advertising, branding, logo design, creative, digital marketing, media planning and buying, TV and radio advertising, public relations, Web design and development, email marketing, social media marketing and SEO. View MDG Advertising’s creative marketing portfolio.